The formation of bacterial spoilage communities in food is influenced by both extrinsic and intrinsic environmental factors. While many reports describe how these factors affect bacterial growth, much less is known about interactions among bacteria, which may influence community structure. 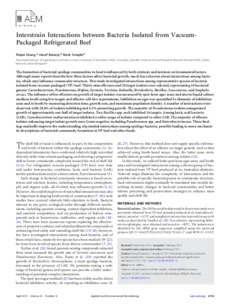 This study investigated interactions among representative species of bacteria isolated from vacuum-packaged (VP) beef. Thirty-nine effectors and twenty target isolates were selected, representing ten bacterial genera: Carnobacterium, Pseudomonas, Hafnia, Serratia, Yersinia, Rahnella, Brochothrix, Bacillus, Leuconostoc and Staphylococcus. The influence of live effectors on growth of target isolates was measured by spot-lawn agar assay, and also in liquid culture medium broth using live targets and effector cell-free supernatants. Inhibition on agar was quantified by diameter of inhibition zone, and in broth by measuring detection time, growth rate, and maximum population density. A number of interactions were observed, with 28.6% of isolates inhibiting and 4.2% promoting growth. The majority of Pseudomonas isolates antagonised growth of approximately one-half of target isolates. Two Bacillus spp. each inhibited sixteen targets. Among lactic acid bacteria (LAB), Carnobacterium maltaromaticum inhibited a wider range of isolates compared to other LAB. The majority of effector isolates enhancing target isolate growth were Gram-negative, including Pseudomonas spp. and Enterobacteriaceae. These findings markedly improve the understanding of potential interactions among spoilage bacteria, possibly leading to more mechanistic descriptions of bacterial community formation in VP beef and other foods.